US Ambassador to UN Nikki Haley says Israel 'one of our best allies', calls embassy move 'the right thing to do'. United States Ambassador to the United Nations Nikki Haley praised President Donald Trump’s decision to recognize Jerusalem as the capital city of Israel on Wednesday, and announce the planned relocation of the embassy from Tel Aviv to Jerusalem. 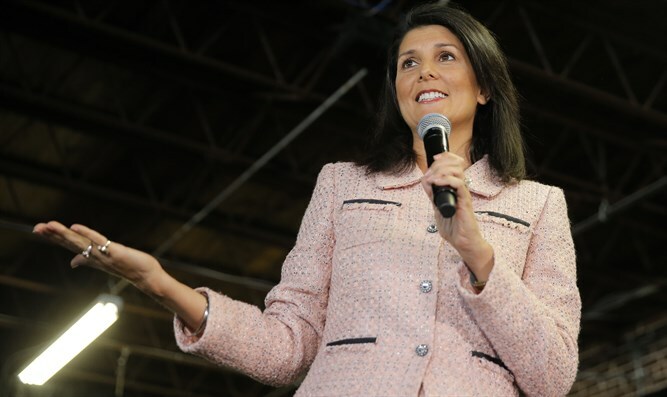 Speaking on Fox News on Sunday, Haley said the move was “the right thing to do”, and argued that it would help get “the peace process going forward”, despite strenuous opposition by the Palestinian Authority and Arab leaders. “There have been presidential candidates on both sides of the aisle who have all said that Jerusalem is the capital of Israel. So all that we have said is 'Enough talking about it, let's do it. This is the will of the American people. The president wanted to follow through. Presidents Bush, Clinton, and Obama all said they were for it, but never did anything about it." Haley claimed that the move would enhance prospects for a major peace deal, despite a wave of riots and violent demonstrations across the Muslim world, including a rash of violent incidents in Israel on Friday and a stabbing attack in Israel’s capital on Sunday. "We actually think this is going to help us fastball the peace process going forward." "The president said that it is time that we acknowledge reality. It's been 22 years in the making. It was time...it was the right thing to do. Israel should be no different. We didn't set any parameters, we didn't this was the final status. What we said is, we're going to do what we do in every other country and put the embassy in the capital." During the interview on Sunday, Ambassador Haley also criticized the United Nations for its “Israel-bashing sessions”, adding that the anti-Israel bias hurt, rather than helped, the peace process.